Measures approximately 2.5” diameter x 10” tall . 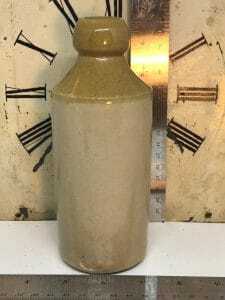 This listing is for (1)Antique Advertising Pot Ginger Beer. J HOPKINS Helena Street Smethwick with the trademark of an Anchor with Crown overlay Trademark. Great condition dates back to late 1800’s – early 1900’s.